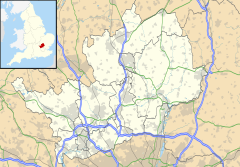 Harpenden (/ˈhɑːrpəndən/) is a town in the St Albans City district in the county of Hertfordshire, England. The town's population is just over 30,000. Harpenden is a commuter town, with a direct rail connection through Central London and property prices well over double the national average. Geographically it is located between (and a short distance from) two much larger neighbours: Luton town (to the north) and the city of St Albans (to the south). It is flanked by the villages of Redbourn (to the west) and Wheathampstead (to the east). Church Green in Harpenden Town Centre during Spring. There is evidence of pre-Roman Belgic farmers in the area. In 1867 several items were found including a bronze escutcheon, rams-head shaped mounts, and a bronze bowl. There are Roman remains in land around Harpenden, for instance the site of a mausoleum in the park at Rothamsted. A tumulus near the river Lea was opened in the 1820s and it contained a stone sarcophagus of Romano-Celtic origin. Five objects dating from around 150 AD, were inside including a glass jug with a Mediterranean stamp and samian ware dishes used for libations. Up to the 13th century the area of the parish consisted of woodland with small hamlets and single farmsteads around cleared areas called "End" or "Green" and there are 19 Ends and 18 Greens in area of Harpenden and Wheathampstead parishes. Many of these still survive today. Harpenden village grew out of Westminster Abbey's gradual clearing of woodland for farming and settlement within its Wheathampstead manor, granted by Edward the Confessor in 1060. A first reference to a parish church is in 1221 (where it is referred to as Harpendene) so it is inferred that the village grew up around then. The church of St Nicholas is the oldest church in the town, originally built as a Chapel of ease in 1217. Just beyond the southern edge of the town lies Nomansland Common (sometimes simply called "No Man's Land") upon which part of the Second Battle of St Albans was fought during the Wars of the Roses. Nomansland Common also saw the first annually contested steeplechase in England, in 1830 when it was organised by Thomas Coleman, and the last fight of nineteenth century bare-knuckle fighter, Simon Byrne. It was also the haunt of the highwaywoman Lady Katherine Ferrers, better known as the "Wicked Lady". A widespread but now little-known industry of Harpenden was straw-weaving, a trade mainly carried out by women in the nineteenth century. A good straw weaver could make as much as a field labourer. The straw plaits were taken to the specialist markets in St Albans or Luton and bought by dealers to be converted into straw items such as boaters and other hats or bonnets. The arrival of the railway system from 1860 and the sale of farms for residential development after 1880 radically changed Harpenden's surroundings. First the Dunstable Branch of the Great Northern Railway passed through the Batford area with a station later named Harpenden East railway station (this line is now closed and forms a cycle track). Then the main line of Midland Railway was built in 1868 with a station near the main village which still exists today. The Harpenden and Hemel Hempstead Railway, known locally as the Nicky Line was opened in 1877. Between 1848 and 1914 the common was a regular venue for horse racing. In his History of Hertfordshire in 1879, John Edwin Cussans commented "Notwithstanding that these meetings are under the most unexceptional patronage as regards the Stewards, yet for two days in the year all the London pickpockets, sharpers and blackguards who happen to be out of gaol are permitted to make Harpenden their own and to make travelling in a first-class carriage on the Midland Railway a danger to men and an impossibility to ladies." Golf has been played on the Common since 1894 and it was at that time Harpenden Golf Club was set up by a group of Harpenden people with the help and a financial contribution of 5 pounds from Sir John Bennet Lawes of Rothamsted Manor. The club moved to a new course at Hammonds End in 1931, at which time Harpenden Common Golf Club was formed by those who wanted to remain at the Common. In 1932 Bamville Cricket club was formed and shares part of the Common with the Golfers. Harpenden is the home of Rothamsted Manor and Rothamsted Research (formerly Rothamsted Experimental Station and later the Institute of Arable Crops Research), a leading centre for agricultural research. In front of its main building, which faces the common, is a stone, erected in 1893, commemorating 50 years of experiments by Sir John Bennet Lawes and Joseph Henry Gilbert..
Lawes inherited the family estate at Rothamsted in 1834. Acknowledged as "the father of agricultural science", his early field experiments on Hertfordshire farms led him to patent a phosphate fertiliser, the sales of which enriched him immensely. With the proceeds, he established the experimental station, building laboratories in the 1850s. The station continued the development of the artificial fertilisers on which most modern farmers now depend. Some of the long-term 'classical field experiments' begun by Lawes and Gilbert remain in place to this day (such as Broadbalk) representing a unique resource for agricultural and environmental research. In 1913 the National Children’s Home moved to Harpenden with a large site Highfield Oval which was home to over 200 children. The site featured a print works, a carpenters’ and joiners’ shop, a bootmakers shop and a farm where boys undertook apprenticeships. Girls were mainly trained in domestic service with some being trained in sewing and office work. The children lived in a "family" of 8-10 children each run by a sister or house mother. The chapel was gift from Joseph Rank and was built in 1928. The home was run on site until 1985. The site is now the head office of Youth with a Mission an international Christian missionary organization. The Harpenden Growth Study, one of the earliest longitudinal tests, was overseen by James Mourilyan Tanner and monitored the development of many of the children over a number of years. During the Second World War, Harpenden was used to evacuate children from heavily-bombed London. However, Harpenden was not totally confident in its safety, as evidenced by the now decaying Bowers Parade air raid shelters, soon to be secured for the future. It has been suggested both that it be used for educational and emergency training purposes. As Harpenden is located in Hertfordshire just outside London, Harpenden is an area of extremely high property costs. This is common in the region. Land Registry data suggests that the average house price in Harpenden in the 1st quarter of 2006 was £500,902 (against £287,277 for St Albans District generally, and £183,598 nationally). The data also indicates that an unusually high proportion of houses in Harpenden are owner occupied (81.4%, as opposed to 69.6% in the District generally, and 66.2% nationally). The average price of a detached house is over £900,000 as of January 2012. Harpenden has a large number of its streets named after English literary figures on the East side of the town (an area known, unsurprisingly, as the Poets' Corner), including Byron Road, Cowper Road, Kipling Way, Milton Road, Shakespeare Road, Spenser Road, Shelley Court, Tennyson Road, Townsend Road, Masefield Road and Wordsworth Road. The River Lea flows through the Batford neighbourhood. Harpenden railway station is served by Thameslink on a frequent and fast rail link through central London. Suburban services stop at all stations on the route, while express services stop at St Albans City before continuing non-stop to London St Pancras International, (Harpenden to St Pancras International – 25 minutes). Trains run north to Luton, Luton Airport Parkway and on to Bedford. From London St Pancras International, trains continue south through major London interchanges such as Farringdon and London Blackfriars before continuing on to Brighton via Gatwick Airport, Sevenoaks or Wimbledon and Sutton. The rail link therefore gives direct access to London Luton Airport (one stop north) and London Gatwick Airport (approx 1hr 10 m on a limited stops train). Wikimedia Commons has media related to Harpenden railway station. The Nickey Line railway used to link Harpenden, Redbourn and Hemel Hempstead. It has since been converted to a path forming part of the National Cycle Network. The A6 used to run through Harpenden, although the road numbering was changed to avoid congestion. The M1 runs nearby. The closest access to the M1 is Junction 9 at Redbourn & Dunstable or alternatively Junction 10 for Luton & Airport. A number of bus services pass through Harpenden. There are four main routes. A fifth bus service, the Metroline 84A, which served Luton Airport, St Albans, and stops to New Barnet, ceased running between Luton Airport and St Albans in April 2017. Harpenden is a prosperous town. In an analysis of the average income tax paid by constituency, Hitchin and Harpenden came 10th. In a list of the most valuable commuter areas compiled by Savills Research Harpenden came 7th. Good transport links to central London have been cited as a key factor. Rothamsted Research, the largest agricultural research centre is based in Harpenden, it was founded in 1843. Harpenden has many shops commonly found in other English towns, with three central supermarkets (Sainsbury's, Marks and Spencer and Waitrose), multiple female clothes shops, charity shops, banks, estate agents and chemists. A good proportion of these are run by independent retailers. Cafes are also common in Harpenden, but with only two commercial chains (Costa Coffee and Caffè Nero); the rest are owned independently. There are multiple restaurants, mainly of Italian origin, and many pubs. The Batford and Southdown, and Luton Road districts also have their own shopping areas. A notable feature of Harpenden is its abundant parks and commons. The central area of Harpenden, known locally as "the village" is characterised by Church Green, Leyton Green and the High Street Greens, which give the town its provincial feel. Just to the south of the town centre is Harpenden Common, stretching from the shops in the town centre for more than a mile to the south, encompassing a total of 238 acres (96 ha). Today Harpenden Common hosts two cricket clubs, Harpenden Cricket Club, a Hertfordshire Premier League club that celebrated its 150 anniversary in 2013 and Bamville Cricket Club who play on Sundays on the golf course, a football club, bridle ways for horse riding, ramblers' paths and Harpenden Common Golf Club, all contained in an area of natural beauty which was awarded a national Green Flag Award in 2007. Harpenden Town Council is keen to help retain and maintain the environment and oversees habitat issues including bird and bat watching, the maintenance/regeneration of gorse, fungi and all the original wildlife (fauna and flora) for the benefit of the people of Harpenden. Since 1894 Harpenden Common Golf Club has traditionally maintained a large part of the common and today works closely with Harpenden Town Council and Countryside management. This partnership has enabled the people of Harpenden to take full advantage of the common for all kinds of leisure activities, and the relationship of the golfers and others users has been excellent for many years. In addition the town has large green public spaces available in Rothamsted Park, Batford Park, Kinsbourne Green, Lydekker Park and the Nicky Line which bisects the town. Just to the south of Harpenden is the large expanse of Nomansland Common. St. George's School, a State Boarding School and specialist Technology, and Language College. Sir John Lawes School, a specialist Media Arts College, Science College and Teacher Training college. Roundwood Park School, a specialist Mathematics and Computing College and Language College. A new secondary school, Katherine Warington School, is being built with the intention of opening in September 2019. Aldwickbury School is an independent all-boys preparatory school (years Reception to 8). The King's School is an independent Christian school (pre-school age to year 11). St. Hilda's School is an independent primary school for girls (years Reception to 6). Harpenden Lions Highland Gathering continues a tradition that began in 1946. The Gathering is held every July in Rothamsted Park and attracts typically 5,000 visitors. It claims to be the largest UK Highland Gathering outside of Scotland. It raises many thousands of pounds each year for charities nominated by Harpenden Lions Club who run the event. An annual classic car show, "Classics on the Common", is held on the last Wednesday in July attracting over 10,000 visitors and 1300 cars. One of the biggest events of its type in Europe, it is a free event with any profits collected going to charity. The annual HERTS 10K run in aid of Rennie Grove Hospice Care takes place on the second Sunday in October. The event attracts thousands of runners and walkers making it one of the biggest 10k runs in Hertfordshire. The event starts and finishes at Rothamsted Research. Craig Charles, comedian and actor in Red Dwarf and Coronation Street and host of the Funk and Soul Show and Robot Wars lived in Harpenden. Dave Clarke visually impaired Paralympic GB football captain. Joanna Dennehy, serial killer responsible for the Peterborough ditch murders grew up in Harpenden. Mick Harford Ex-England International Football Player and Manager. Currently working for Luton Town Football Club whom he has previously managed. John Keane, artist, was born here and grew up in Wordsworth Road. There is scouting in Harpenden. Scout groups fall under the heading of the "Harpenden and Wheathampstead District Scouts". As well as taking part in a number of volunteer roles and marching in both the Remembrance and St George's Day parades, they are involved in the Harpenden and Wheathampstead District Scout Gang Show, an annual variety show. The Harpenden Gang Show recently[when?] earned the accolade of being the world's longest continuously running Gang Show, with a performance every year since 1949. There are also several Guide units in Harpenden. Guides take part in the Remembrance Sunday and St Georges day parades alongside the Scouts and has younger counterparts called Rainbows and Brownies. ^ "Local statistics - Office for National Statistics". www.neighborhood.statistics.gov.uk. Archived from the original on 4 March 2016. Retrieved 3 May 2018. ^ "Current House Prices in Harpenden". Archived from the original on 20 October 2013. Retrieved 18 February 2013. ^ Casey, Les (18 February 2011). "Iron Age Burial in Harpenden, Pre-Roman settlements in the Lea Valley at Batford". Harpenden Local History Society. Archived from the original on 24 April 2014. Retrieved 11 June 2012. ^ Ross, Rosemary (8 February 2011). "Traces of Roman occupation, Fragments found by builders or in field surveys". Archived from the original on 24 April 2014. Retrieved 11 June 2012. ^ Wilson, Pat (September 1977). "Burial Mound in the Lea Valley, Romano-British sarcophagus found in the 1820s". Harpenden Local History Society. Archived from the original on 24 April 2014. Retrieved 11 June 2012. ^ Ross, Rosemary (30 November 2010). "Ends and Greens (adapted from The Settlement of Wheathampstead & Harpenden, Vol 1, WEA)". Harpenden Local History Society. Archived from the original on 18 March 2011. Retrieved 11 June 2012. ^ Brandreth, Eric (October 1975). "Notes on the Growth of Harpenden". Harpenden Local History Society. Archived from the original on 23 May 2014. Retrieved 11 June 2012. ^ "National Children's Home". Harpenden and District Local History Society. May 2002. Archived from the original on 28 January 2013. Retrieved 8 October 2012. ^ "National Children's Home Open Day programme". 20 June 1953. Archived from the original on 28 January 2013. Retrieved 8 October 2012. ^ "Growingup in the nch Forum: Harpenden - Highfield - Harpenden, Herts". Archived from the original on 22 June 2012. Retrieved 8 October 2012. ^ "What are Little Boy's Made Of?". Their History a history of a child in Care. Archived from the original on 6 August 2016. Retrieved 2 May 2016. ^ Source Archived 28 September 2007 at the Wayback Machine. Part of the discrepancy is explained by the "top-heavy" nature of the Harpenden property market, which has a disproportionately high level of detached houses (40.8% in Harpenden, against a national average of 22.8%) and a disproportionately low level of flats (16.5% in Harpenden, against 19.2% nationally) and, slightly perplexingly, significantly fewer terraced houses (15.4% in Harpenden, against a national average of 26.0%). ^ "House Sale Prices in AL5 during January 2012". Home.co.uk. Archived from the original on 3 May 2018. Retrieved 7 November 2012. ^ Brignall, Miles (1 May 2016). "Elmbridge again comes top for income tax contributions". The Guardian. ISSN 0261-3077. Archived from the original on 2 May 2016. Retrieved 2 May 2016. ^ "Property market: 20 most valuable commuter areas". The Telegraph. Archived from the original on 10 June 2016. Retrieved 2 May 2016. ^ "Timeline – Katherine Warington School". kwschool.co.uk. Archived from the original on 27 June 2018. Retrieved 20 January 2019. ^ Clark, Emma (7 July 2010). "Interview: Harpenden golfer and commentator Ken Brown". Hertfordshire Life. Archived from the original on 21 October 2013. Retrieved 20 October 2013. ^ Gazette, Evening (12 May 2003). "Me and my health". gazettelive.co.uk. Archived from the original on 3 June 2009. Retrieved 3 May 2018. ^ Craig Charles' Funk and Soul Show, BBC 6 Music 16 December 2017. He said on air that he used to live in Harpenden but moved away as it was too posh. ^ Morris, Steven (12 February 2014). "From netball team to psychopath: the strange descent of Joanna Dennehy". The Guardian. ISSN 0261-3077. Archived from the original on 4 May 2016. Retrieved 2 May 2016. ^ "Warming Up". Richard Herring.com. 5 March 2012. Archived from the original on 10 March 2012. Retrieved 7 November 2012. ^ Vacher, Peter (19 March 2013). "Terry Lightfoot obituary". The Guardian. ISSN 0261-3077. Archived from the original on 27 April 2016. Retrieved 2 May 2016. ^ "Oral evidence taken before the Education and Skills Committee". parliament.uk. 23 June 2003. Archived from the original on 24 September 2015. Retrieved 21 July 2014. ^ "Harpenden resident from 1960-1984 | Eric Morecambe | People | Harpenden History". www.harpenden-history.org.uk. Archived from the original on 6 April 2018. Retrieved 6 April 2018. ^ "David Richardson Biography". Sound Recording Technology. Archived from the original on 17 August 2015. Retrieved 24 June 2015. ^ "Harpenden Lions Club". Archived from the original on 13 January 2017. Retrieved 11 January 2017. Wikimedia Commons has media related to Harpenden. "Harpenden" . Encyclopædia Britannica. 13 (11th ed.). 1911.